The IP Communications High-Density Digital Voice/Fax Network Modules are the latest addition to the Cisco Systems IP Communications suite of solutions. The IP Communications High-Density Digital Voice/Fax Network Modules deliver high-density digital voice connectivity, high-density WAN connectivity, analog voice connectivity, and conferencing and transcoding capability in a network module form factor. 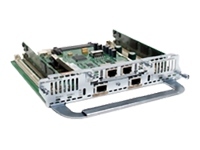 The network modules provide enterprises, managed service providers, and service providers with the ability to directly connect the public switched telephone network (PSTN), traditional telephony equipment (such as private branch exchange (PBX), key systems, analog telephones, and fax machines), and WAN to existing Cisco 2600XM, Cisco 2691, and Cisco 3700 Series Multiservice Access routers for either IP Communications capabilities or pure toll bypass. The IP Communications High-Density Digital Voice/Fax Network Modules flexibly operates within two different Cisco AVVID (Architecture for Voice, Video and Integrated Data) IP Telephony environments - the Cisco CallManager system with Survivable Remote Site Telephony (SRST) or Cisco CallManager Express. The network modules can be integrated with these IP Telephony solutions in a Multiservice Access Router, to provide a complete IP Communications solution for full service branch customers. The IP Communications High-Density Network module is supported on the Cisco 2600XM, Cisco 2691, and Cisco 3700 Series Multiservice Access routers, providing a broad range of selection depending on branch office sizes and communications needs. The network module can be reused as the platforms scale, delivering investment protection.